Despite the fact that there was a continuous downpour of rain all the afternoon, almost the whole population of Arborfield and Newlands [sic] gathered to witness the unveiling of the village war memorial on Saturday afternoon. The memorial is in the form of a rustic Celtic cross of Cornish granite and the names of the ‘glorious dead’ are inscribed on the base. The ceremony was performed by Mrs. Stuart Rickman, formerly of Arborfield Grange. The service commenced with the singing of the hymn “O God, our help in ages past”, and this was followed by a prayer of dedication, recited by the Vicar, the Rev. J. A. Anderson. Mr. John Simonds, who represented the Memorial Committee, said they had met to do honour to those brave men of Arborfield and Newlands who gave up their lives in the late war. Everyone would remember that when the question of a memorial was first brought up, there were differences of opinion as to what form it should take. Some suggested that it should take the form of a structure in the villages, while others thought that something in the church or churchyard was preferable. He thought they could congratulate themselves that the difficulty had been so well adjusted. The excellent support given when the appeal for funds was made caused the committee to consider that they were quite justified in carrying out the wishes of all parties. So the cross had been erected, and it was proposed that a tablet should be placed in the church later. Those men whom the cross commemorated had participated in the most terrible war history had ever known, and the village was proud of them. They came forward at the call of the King and country, and fought for right and for their country. They were all grieved that so many of them would never return, and it was to their memory that the cross was erected. It was not that they would ever forget them, for their memory was engraved in every heart, but the memorial might act as an incentive to the people of Arborfield for generations to come, and if need be, though he hoped the occasion would never arise, to urge the men to come forward to fight for the right, and to fight for their King and country. Mrs. Stuart Rickman then unveiled the cross, after which the National Anthem was sung. Mrs. Rickman then said that when she was invited to come to Arborfield to unveil the memorial, she realised that the inhabitants were conferring on her the very greatest honour, and she was very touched by it. The parishioners had shown her numerous honours during the time she resided there, and she thanked them from the depth of her heart. They had been her friends in both her happy days and her sorrows. It would, she thought, have been better if some great commander could have unveiled the cross, for he could have spoken of the men's splendid services and their bravery, which it was quite impossible for her to do adequately. But she could speak for the men as she knew them in their childhood, and also of how unflinchingly they went forward at the call of duty. She could not allow the occasion to pass without paying a tribute to the parents and wives of those men, to those who were left behind, and who bore the strain of waiting through those long years splendidly and with great fortitude. The cross would stand for a three-fold meaning. Firstly, it was a cross of their remembrance to those who made the victory possible. thirdly, it was a cross of endurance, a memorial for future generations, to remind them of the glorious deeds of their forefathers. Mr. Kenneth L. C. Prescott, chairman of the Arborfield Parish Council, thanked Mrs. Rickman for unveiling the cross. During the time that Mrs. Rickman had lived in the parish, she had gained the esteem and admiration of all who came in contact with her. That day they had come to carry out the last act of the war, to render homage to the dead for having done their part. He now asked those present to do their part by striving to preserve what those men had died for - liberty and the welfare of their country. They could not forget the men, and those who had suffered would find sympathy in their countrymen, and in the knowledge that the sacrifices of their men were not in vain. The spirit of their glorious dead was embodied in that memorial. When that spirit ceased to be amongst them, then the end of their Empire would be near at hand. He asked the children always to look upon the cross with reverence and gratitude, to remember the tyranny with which they had been threatened, the sacrifices which had saved them, and the warning it provided. He trusted the example of those brave men would never fail, but that everyone would prove themselves worthy of those who had died for them. Mr. F. W. Seymour, district councillor for Arborfield and Newlands, also referred to Mrs. Rickman's kindness. Following this a number of beautiful wreaths were laid at the foot of the memorial by relatives and others. One splendid floral tribute was from the Rector and Mrs. Anderson, "in long and thankful remembrance of the men of Arborfield and Newlands who fought and died for their country". The Rector said they came with thankfulness to God and thought of those in whose memory the wreaths were placed on the memorial. Some of the fallen were active members of the church choir, some were bell-ringers, while all were their personal friends. Their spirits were now with God, and they were now calling upon those left behind to live for the betterment of England and of the world. The cross was a reminder of Him Who died for the world. Buglers R. White and E. Drew, of the Royal Berks Depot, Reading, sounded the "Last Post", after which the company stood in silence for a few minutes. A guard of honour was formed by the 1st Arborfield Boy Scouts, under A.S.M. Bentley, the Arborfield Girl Guides under Leader Nellie Rogers, and the Brownies under Pack Leader Nancy Smith. The cross was constructed by Messrs. Harry Hems, of Exeter, and was erected by Messrs. Garrett Bros., of Arborfield. 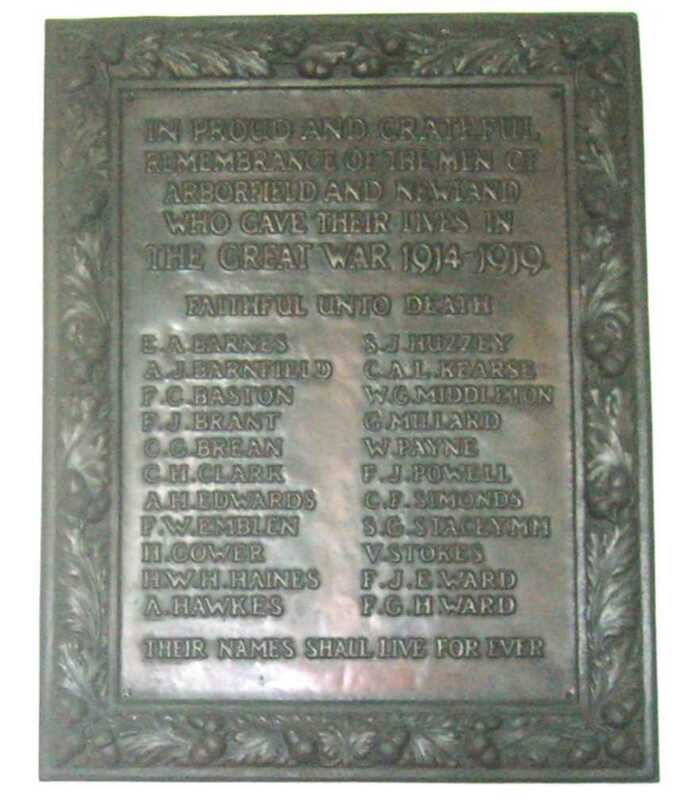 On Sunday at the close of the morning service Mr. John Simonds unveiled a memorial tablet that has been placed in the Parish Church in memory of the men of Arborfield and Newland who fell in the war. In the course of a brief address Mr. Simonds said that the memorial would be a testimony to future generations of what their forefathers had done and suffered for their country and a call for all time to the people of Arborfield and Newland to follow in the steps of those whose names were inscribed on the tablet, and to whose loyalty and service they owed so much. The dedication prayers were then offered by the Rector. The tablet, which is much admired, is the work of Messrs. WIlliam Morris & Co. It is in reproussé copper. 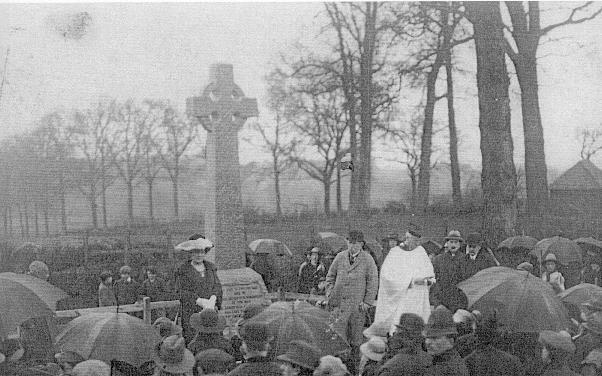 Included in the congregation were some 40 members of the Arborfield Post, comrades of the Great War, who paraded at Arborfield Cross and marched to Church, and a patrol of the Arborfield Troop of Boy Scouts, who had returned the previous day from camp at Holme Park, Sonning.